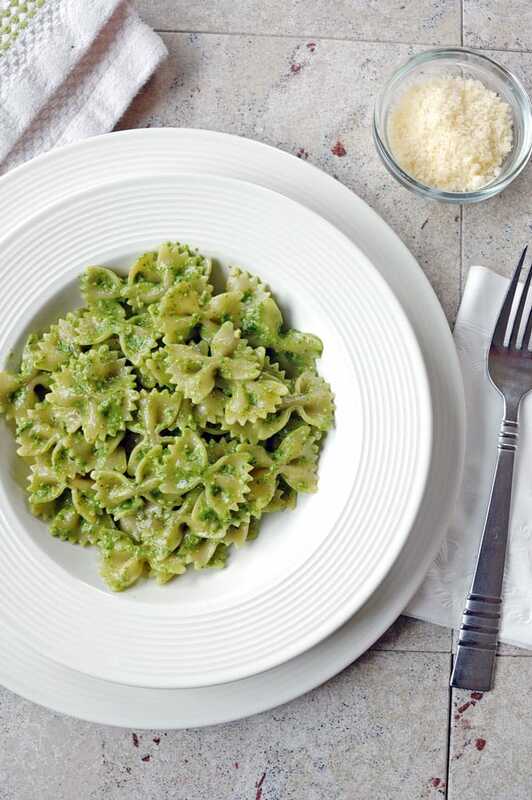 You just need five minutes to make this Easy Spinach-Walnut Pesto! It makes a great pasta sauce or pizza topping. Someday, I’ll have to share Mom’s basil pesto with you, and the story that goes with it. 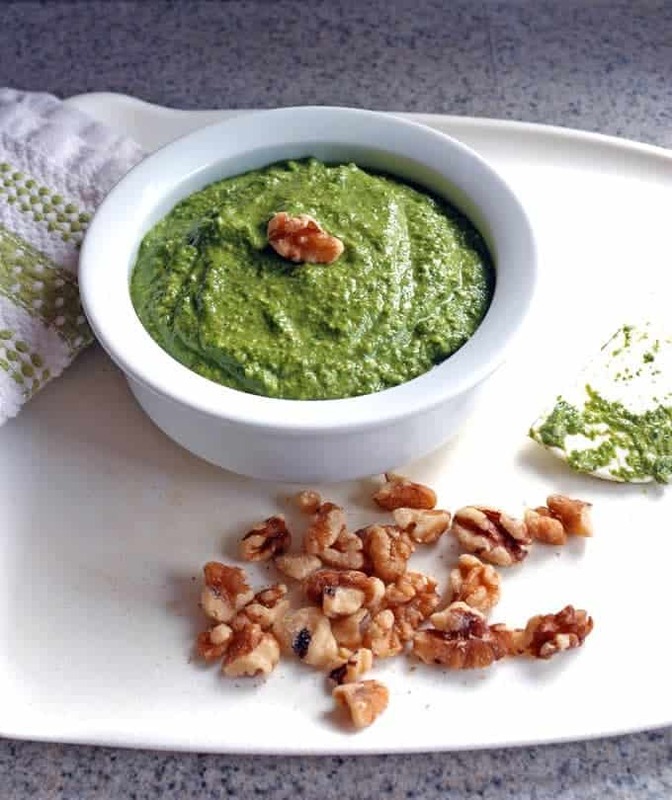 But this easy spinach-walnut pesto is delicious and can be thrown together with a bag of washed spinach leaves from the grocery store. So I don’t need a deer-free yard — or a green thumb. All I need is five minutes, and if I’m making pasta to go with the pesto (you might have guessed that’s my usual choice), then it’s a 20-minute meal, tops. And there’s no sautéeing nor chopping by hand. I just put my food processor to work (if you don’t have one, use a blender and pulse carefully.) Toss the spinach, cheese, nuts, garlic, olive oil and seasonings into the machine, pulse, scrape the sides, pulse some more, and that’s it. 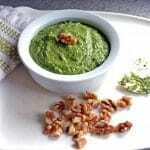 I’ve been making this easy spinach-walnut pesto for years, and my family loves it. You’ve got to try it! Here’s the most important tip for best results: Use freshly grated Parmesan cheese. In just five minutes, you can make this delicious, Easy Spinach-Walnut Pesto. My family loves this stirred into pasta and spread on sandwiches. Gluten free. If you need to grate your cheese, cut up your Parmesan wedge into chunks and put them in your food processor or blender. Chop them until the cheese is the right consistency. Rinse your spinach, if needed, and pat dry. Add the spinach and all ingredients to the bowl of the food processor. Pulse until you have the consistency of a smooth paste, stopping once to scrape down the sides of the bowl. 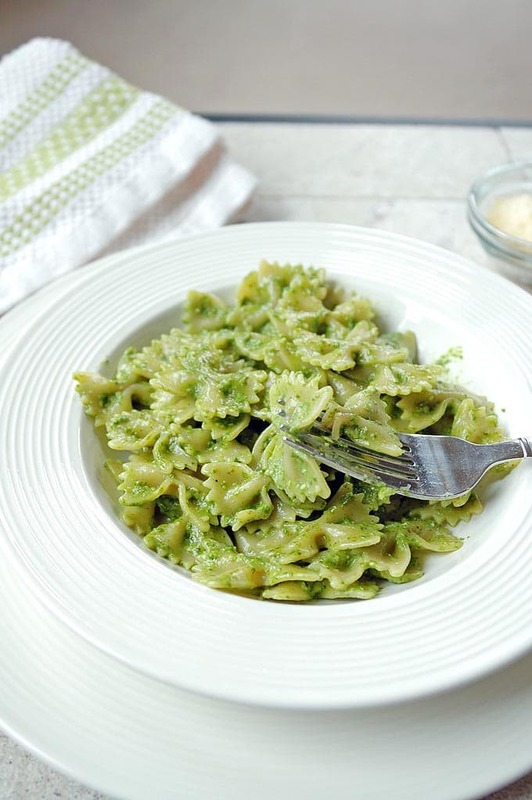 Serve the pesto stirred into pasta, spread on sandwiches, or use as a dip. You also can use it as a topping for chicken or fish. Store pesto in the refrigerator up to one week. For ideal texture, use a food processor instead of a blender. If you only have a blender, just pulse the ingredients instead of letting your blender run for too long, or you will end up with more of a liquid texture instead of a paste. If serving with pasta, you can put water on to boil in a pot on the stove and make your pesto in the meantime. When the pasta is done, drain it, return it to your pot, and add 3-4 four heaping tablespoons of pesto per pound of pasta, stirring and adding more to taste. I can’t believe it but I actually grew basil this year…it’s normally too cold here and it only lasts a few weeks. It is so nice to have fresh basil! But I love the looks of this spinach pesto, especially that you don’t need to cook it first. Looks so delicious! Yay for basil! You can freeze it too, if you have enough and want to make it last. But this spinach pesto has a really nice flavor and is so easy. I’m thinking about making a few batches to freeze and have on hand. Thanks, Denise! I love that you have an herb garden. Nothing beats fresh!